Linda Kroll’s love of words and stories were sown in her childhood by her poetry-writing grandmother, her poetry-reading mother, and her story-telling father. Hearing the refrain of folk singer Phil Ochs’ When I’m Gone (“I guess I’ll have to do it while I’m here”) shortly after her mother’s death sparked her own plunge into writing poems. She loves the music of poetry—the interplay of sounds and the pulse of its rhythms. She primarily writes verse stories for children. Linda grew up outside of Chicago, and every summer her family spent a few weeks enjoying the silky water and sandy beaches of a lovely lake in central Wisconsin. Although she went on to live in several states and three foreign countries, most summers she managed to spend a week or two back at a that small lake. Eventually she moved closer to it and now resides in the Fox Cities. Linda has degrees in education, comparative literature, and German. She has been a college instructor, a high school teacher, an elementary school tutor, and a storyteller. 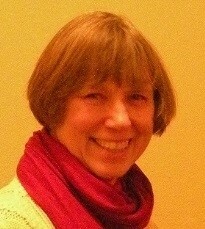 She is a member of the Wisconsin Fellowship of Poets and the Society for Children’s Book Writers and Illustrators. The verse story Winter, Awake! (Bell Pond Press). Available on Amazon.com. sits on a slat-backed chair. stretch out over its edge. cuts across the smooth forehead. rests amid metal coils and cranks. the slack mouth smiles faintly. that look back and in. That wove a dance on Winter's shape. "We're sleek and sleepy, sluggish, slow. Beneath the slush and rushing winds. Shake off your slumber, frosty prince! Let sleeping cease and cold commence!" They shook and shimmied, swayed and heaved. Ssslither, ssslip! the snakes seethed.